Wattpad has built quite a following with horror fans this year by hosting prominent horror campaigns with well-known entertainment franchises. Our community loves a good story and horror-junkies live for the adrenaline rush of a good fright. Earlier this year we worked with Warner Bros. to support the launch of feature horror film The Gallows. We invited the directors of The Gallows to create two exclusive and serialized stories on Wattpad. The stories rolled out in the weeks leading up to the launch of the film. As the stories built momentum, conversations began surging on the Gallows official profile and helped raise tremendous awareness and excitement for the film. During this campaign we also worked with well-known Wattpad horror influencer Zoe Aarsen to create a commissioned story for The Gallows, called Initiation, which has received over 47K reads to date. The campaign was an exciting intersection of brand, creators, and audience. 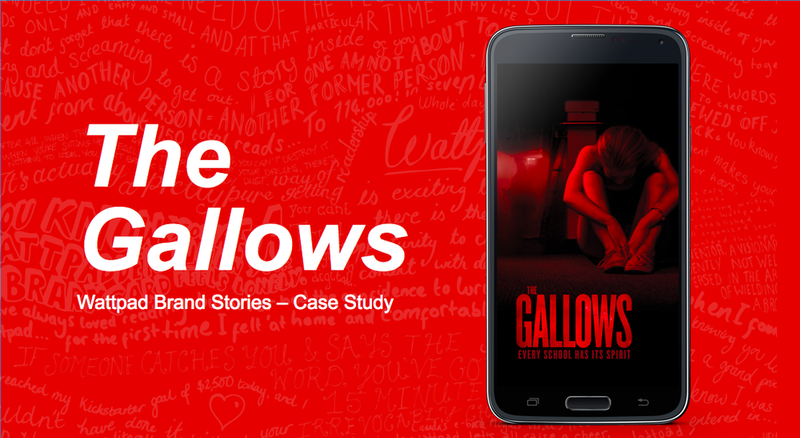 The community loved the exclusive access to content written by The Gallows directors and continued to engage on Wattpad throughout the campaign period about both the film and the stories. For a glimpse into this unique campaign download the case study here.